If there’s one thing Corvette Racing’s Jordan Taylor loves, it’s his dog Fonzie. Fonzie, unfortunately, had to stay at home for the 24 Hours of Le Mans. So, one group of fans brought him a stand-in Fonzie. I’m pretty sure this is how Corvette Racing won Le Mans—with awwwww. Fonzie is a big lovable puffball of a dog. Taylor chronicled the sad leaving behind of his beloved pooch so well that I’ll let his photos tell the tale. As you can see, neither Fonzie nor Taylor took the news well that Fonzie had to stay at home. Fonzie’s last-ditch attempt to stow away didn’t work, either. Once he was there, though, FaceTime sort of helped bridge the distance. The dog wasn’t physically there, though. 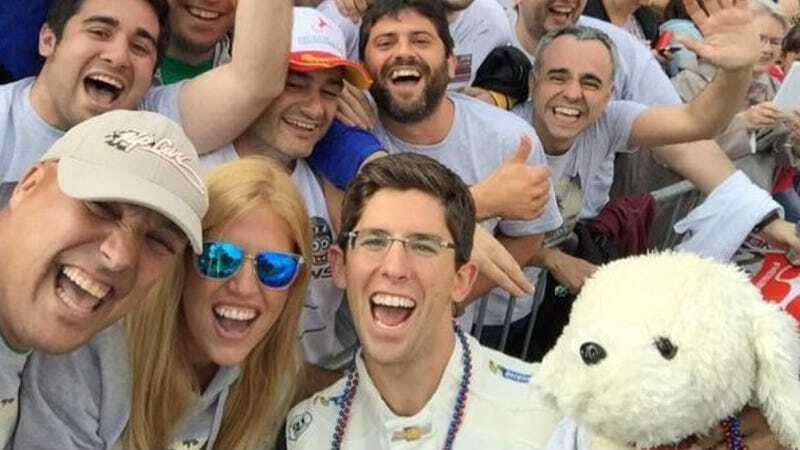 One group of fans called the Nerdmans decided to change that at the drivers’ parade, though. This is still a highlight of the weekend. Seeing the Nerdmans and Fonzie in the drivers parade. I don’t think I’ve ever been so excited. Jumping from a moving vehicle probably wasn’t the smartest decision. Fonzie is already more popular than I am. Even the Nerdmans’ shirts were suitably mullettastic, a nice nod to Jordan’s best hairstyle ever. The stuffed Fonzie was immediately part of the family, even taking part in the “U.S.A. !” chant with fans. We all know how the race ended now: Corvette Racing built up a nice multiple lap lead over AF Corse at the end. All Taylor could think to yell from the podium was the name of his dog when he spotted the fans that gave him the stuffed Fonzie. Meanwhile, Fonzie had another reason for staying home. However, despite Fonz’s newfound lack of huevos, it’s a pretty safe bet to say that the power of Fonzie helped Taylor’s team drive to a win. Jordan Taylor frequently posts his shenanigans on Twitter here, so he’s definitely worth a follow. Contact the author at stef.schrader@jalopnik.com. Alternately, you can always give my stuffed friend a hug.